Wow! I just find your blog through Let the children play, and I LOVE IT!!! I wish you a lot of success and I am looking forward to visiting often! Thank you so much for your delightful comments! I am so happy to hear that you enjoy my site! I find that blogging my experiences at the school helps me become a better teacher as it forces me to ponder the why's and how's of what we do! Be sure to check back next week as I will be adding several new ideas for activities using PVC, pendulums, and pools! Thanks for you ideas regarding the paper shapes! I provide a combination of ways to express creativity because some children love cut out shapes - while others love to simply explore the mediums presented.In my heart it's about the process and no the completed article - but I do work with other teachers who like to provide the cut outs. I do avoid colouring pages at all cost! Those can be done at home or in the after school group. Love your blog - come on over to http://kreativeactivities.blogspot.com/ and share your link! Thanks for your insights, Leeanne! 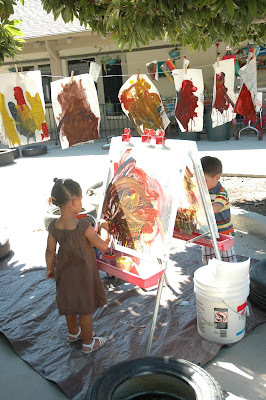 I also work in a Reggio-inspired school, and I have seen this debate first-hand. Several of the teachers have cut-outs of fall colored leaves on their classroom walls. Since I work with two-year-olds, they are not able to cut out leaves; however, they can cut paper enough to make a group collage of fall-colored paper. I feel that, between the use of scissors and squeezing glue, this is a much more developmentally appropriate activity than trying to get children to cut out pre-drawn shapes, or color pre-drawn shapes. Great post! I'm also very process-oriented but I think the occasional cut out paper shape is okay if it is presented in an open-ended fashion (e.g. if the child wants to cut it to make a new shape, we encourage it!). There's such a broad spectrum to be considered "balanced" here. I also think the language we use is critical. In other might say, "Will this pumpkin paper work for you or would you rather cut your own pumpkin shape?" That was it's presented in a way that doesn't assume it is the "right" way to cut a pumpkin. Having real pumpkins (or leaves or whatever) on the table also allows the child to see the real object and to understand that the shaped paper is only one teacher's interpretation. I also totally agree with Kierna although I've been known to do that as well. It also depends on the setting--some children, because they have been inundated with models and pre-cuts, will latch on to the pre-cut, "right" paper. Others, who have been in an environment that encourages self-expression and individual creativity, might be more resilient to the possible negative effects of providing pre-cuts. I am loving all the great opinions here! I sounds like we are all pretty much on the same page, but with slight differences that make our methods our own. Thanks for participating in the debate...I hope there will be more to come! Beansprouts...I thought your use of language was excellent. Asking them which one they'd prefer is a great idea. In the Outdoor Classroom a few weeks back we set out our "paper bucket" (this is a 5 gallon paint bucket that houses the paper and sits right beside the easel) and put in pumpkin shaped paper and rectangle paper. Most children chose the pumpkins, but there were a few who grabbed the rectangle paper. We have a 3-sided see-through easel outside, so it was fun to watch the children painting on their "chosen" paper on all three sides. One little girl chose a rectangle paper, but painted a huge orange pumpkin on it. She cut it out later to match the others. Selfishly, I LOVED the look of the brightly painted pumpkin papers clipped to the rope between the trees and swaying in the breeze. We don't do the cut-out thing very often, but maybe that's why it has such a dramatic effect when we do. Well, Kristin, I have to say that the Halloween season is that which we find the most pre-cut shapes here at Beansprouts. Just today we decorated ghost shaped paper with cotton balls and I let the kids choose the color of paper (why not make them neon colored with white cotton, right?) and whether they wanted a pre-cut or to cut themselves. I was happy to see that several children chose to cut their own. I'll be a proud teacher displaying such individualistic art but I can't say that option would have been there for those kids had I not read this post this morning, so thank you for impacting their day and their lives!